Just a few metres away from its traditional stage, Ray-Ban will present one of the gems of this year’s festival: The Warehouse, an incredible indoor electronic music club powered by Bowers & Wilkins Sound System with its unique and immersive sound. On the site that housed the last year Hidden Stage, this year there will be dancing to electronic music. The programme, of 7 hours of music per day, will come with an undeniable seal of quality: the Thursday 31st May will be directed by Mosaic, the journey into electro and IDM by the DJ and producer Maceo Plex through his alias Mariel Ito, the sessions from Danny Daze and live electronic shows by Carl Finlow, Egyptian Lover, Radioactive Man and Morphology. On the Friday the German label Giegling will be in charge of the beats, with a lineup formed by DJ Dustin b2b Konstantin, Edward live, Molly, ATEQ, Leafar Legov live and Elli. And on the Saturday, Warp will provide a spectacular finale with an extensive selection representative of its new voices and other artists close to its philosophy: live acts by Yves Tumor, Nkisi, Gaika and Kelly Moran and sessions by LYZZA, Tutu, ADR and the unclassifiable Evian Christ. 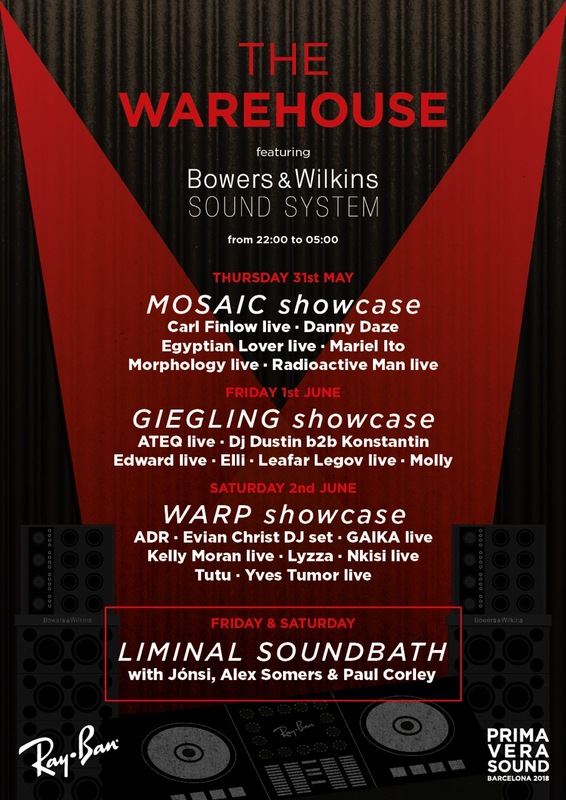 But that is not all: The Warehouse will offer two of the few worldwide performances by Liminal, the new sound project by Jónsi (frontman of Sigur Rós), Alex Somers and Paul Corley, who will start experimenting on the Friday and Saturday at 19:00 pm. It will be a voyage through the Sigur Rós catalogue together with a multitude of other sources in search of their most ambient and hypnotic elements.